Tropicana’s 2009 packaging redesign failure is in my eyes one of the most interesting case studies about branding through packaging design. At The Branding Journal we like to feature branding success stories, however sometimes analyzing branding failures is even more interesting, as it allows us to learn from past mistakes. Tropicana is a very famous brand that sells fruit juice worldwide. On January 9th 2009, the PepsiCo-owned brand decided to replace the existing packaging design for its best-selling orange juice with new packaging for the North American market. 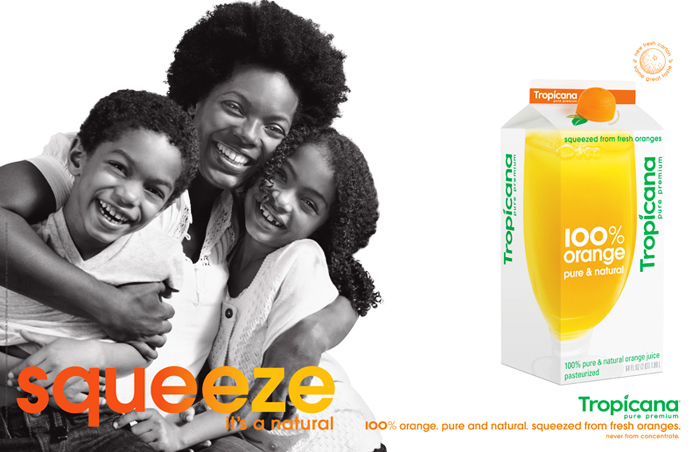 However, this new packaging design was rejected and criticized by the majority of Tropicana’s consumers. The launch of the new packaging was indeed such a failure that Tropicana had to drop it to come back to the original version of the packaging. First of all let’s summarize the facts to better understand the reasons for this packaging failure. Tropicana invested 35 million dollars in an advertising campaign that promoted the new packaging for the fruit juice brand. Both the packaging design and the advertising campaign were created by the same agency; Arnell. On January 8th 2009, Tropicana launched the new packaging for its best-selling product in North America – Tropicana Pure Premium, with sales revenues reaching more than 700 million dollars per year. A few days later, consumers started criticizing the new design, especially on social networks. Two months later, sales dropped by 20%, and this spectacular decrease in sales represented a lost of 30 million dollars for Tropicana. Meanwhile, Tropicana’s competitors took advantage of the “Tropicana crisis” and gained the sales lost by the fruit juice brands. In total, this initiative cost Tropicana more than 50 million dollars. 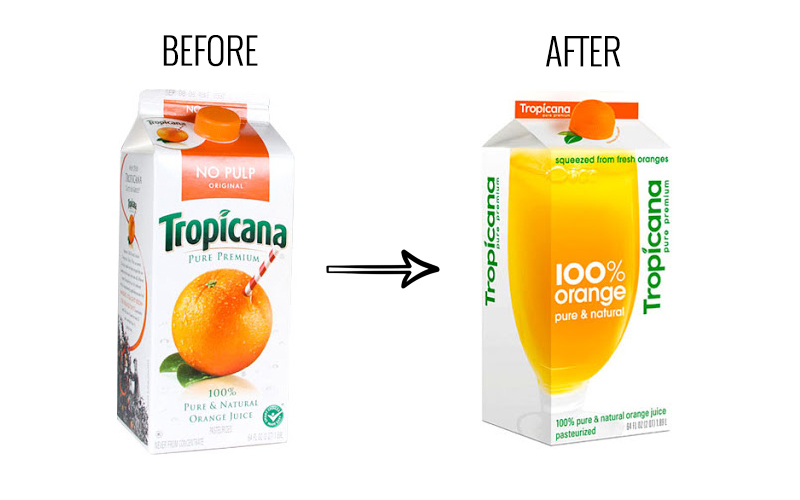 To understand this strategy failure, it is important to analyze what did Tropicana change in its packaging design. “We thought it would be important to take this brand and bring it or evolve it into a more current or modern state.” stated Peter Arnell, director of the creative agency Arnell in his speech explaining the strategy chosen for the Tropicana product. Perhaps one of the most important changes is the fact that a big transparent glass full of orange juice replaced the orange and its straw. Another important difference between the two packs is the new logo design. Tropicana released a new advertising campaign along with its packaging strategy. The main message communicated in this campaign was “Squeeze, it’s a natural”. 5) Understanding the consumers’ reactions: what went wrong? “We underestimated the deep emotional bond they had with the original packaging” […]“What we didn’t get was the passion this very loyal small group of consumers have. That wasn’t something that came out in the research. […] Those consumers are very important to us, so we responded.” explained Mr. Campbell, president at Tropicana North America in Chicago. Perhaps the problem goes beyond this emotional bond consumers had with the old packaging. It is very important to consider the role of packaging design in branding, and its link with merchandising. Young and Ciummo stated in their article that packaging redesigns often come with a small decrease in sales, but this tends to be temporary and has never been as severe as the 20% decrease experienced by Tropicana. The focus on “100% Orange” instead of “Pure Premium”. To finish, and because the packaging had a more simple design than the original one, most consumers described it as “ugly”, and explained it seemed to be from a low-range supermarket brand. Consumers were confused by this new look that made the brand seem to be cheap, as Tropicana had always been perceived as a premium brand. Branding is a complex subject and it is often difficult to predict the market’s reaction to a strategy change. Consumers feel an emotional bond with the appearance of the product and brand they love. Consumers have an emotional connection with brands they purchase and can feel betrayed and disappointed if they suddenly can no longer identify with new brand elements of the packaging design. It is important to always consider this before making changes to packaging designs. Tropicana, while trying to modernize the brand, didn’t respect one of the most important branding rules any company should consider: the product identification and recognition by the consumer. If you want to redesign your product’s packaging, make sure you do not change everything at once. The changes need to be done progressively to ensure the consumer will still recognize the brand. Of course, this only applies for successful brands such as Tropicana. If your brand and product are not doing well, a total rebrand can be a good solution to save the product on the market. In fact, we’ve seen many cases (Herbal Essences comes to mind) in which significant packaging changes have driven sales. Packaging is the last communication element brands have with consumers on the purchasing decision process. Its design and content are essential to the brand because it will influence the consumer’s decision at the last minute. Tropicana’s consumers didn’t recognize or like the new product design, and therefore decided not to purchase it. Advertising and packaging design are very different communication tools. Through advertising, companies have more time and support to communicate emotions and new values. The mission of advertising is to inform and communicate sensations that will last in the long-term. It is a more flexible communication support over time. Through packaging design, companies need to communicate in a more direct, clear and identifiable manner, as the consumer is about to make its final purchase decision. Of course, packaging and advertising strategies should always be in line, as with any marketing activity in general. However, there are some communication codes to each domain that need to be respected. 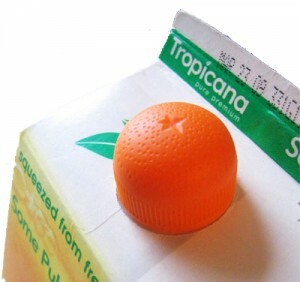 In the case of Tropicana, the packaging codes weren’t, and this caused the failure of the new design. 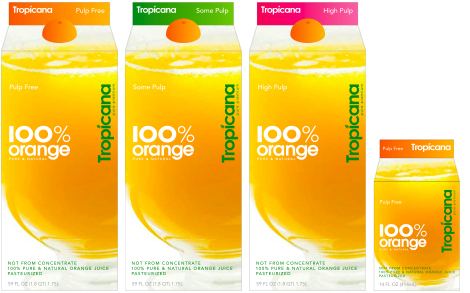 The Tropicana redesign illustrated the considerable power of packaging. While this was a distinctively negative example, it’s important to keep in mind that this same power does often work in a positive direction. The takeaway for marketers and brand strategists should be an even greater respect for packaging and a deeper commitment to leveraging this brand asset with a methodical procedure. This will ensure consumers accept the change in a positive manner! – Marketing Journal: Young Scott y Ciummo Vicenzo. “Managing risk in a package redesign: what can we learn from Tropicana? “. Brand Packaging (August 2009). The original design makes me think of orange juice. The new design looked like the generic no-name OJ that's created by mixing water with concentrate. As for the posters, I don't associate juice with hugs. Conversely I don't like the imagery of cutting my loved ones in half and squeezing the life out of them for breakfast. Those posters just make me go WTF?? I think a lot of your recommendations are far too general. I've worked with clients scarred by the Tropicana ordeal and they've taken away similar "don't change too much" lessons. To me, the Tropicana case came down to leaving a powerful visual asset for a weak one. Yes, it was also about recognizing the brand but, let's say the brand started with a generic glass of OJ. Then, it was faced with a new equity, that was built through years of television spots, of a straw in an orange. Would the brand owners then say, "no, too much of a change"? Not all equities are assets. Trop traded an asset for a (generic) liability. It walked away from a brilliant visual metaphor of drinking right from the orange. Such evocative visual meaning is rare. Shame on Arnell and the brand owners for missing that. Unfortunately, so many Pepsi folks still hold onto the scars of this experience and resist change to a fault. It impedes the ability to greatly elevate their brands. Take a look at Starbucks redesign of Tazo Tea and rethink your advice that only weak brands execute revolutionary redesigns. It's not the amount of change but, rather, the right change. Our culture moves very quickly these days and progressive consumers reward brands that make smart changes. Tropicana was a dumb change. Thank you for your comment Steven! Very interesting insights. Big brands should indeed take some risks, I totally agree with you - especially with packaging, which is a very powerful tool. A great example is the Herbal Essences' packaging redesign after changing their target market. The new design was very different but in that case it worked because they targeted a totally new type of people. It really depends on the case, and on the brand. Thank you Claudia! We will try to write about the Herbal Essence packaging case soon! Marion, the only thing missing is an easy to remember consumer contact number i.e. 1-800 ORANGE JUICE. Indeed, the packaging is the silent sales rep on the shelf, and we should not underestimate it's power. the major problem we are facing nowadays with marketers and the re-branding strategies that are not taking into consideration "the packing power" , the shape, the dimensions, the materials, the feeling that comes to a consumer once he recognize the product. for all the marketers this is an amazing case study to read it before any re-branding brainstorming session. Very interesting case! I'd like to call the attention to a few aspects. First, I did not get any lead about using consumer research to test the effects of such a change, before committing to it. Do you have any information about? Don't you think this should a critical step to a methodical procedure intended to leverage brand value? The other point is that, although you mention an emotional bond, your precise analysis focuses on the perceptual and attentional processes that make packaging modernization so trick. One critical issue we need to take into consideration is when you assume your target market is evolving or growing so you need to grow with them without backing this assumption with research. Thank you for the nice and informative post. Great Article. I really like it. Interesting article about packaging design. it’s important to have memorable designs. This sounds useful if the design can also help enforce your brand so that it can be easily recognized.